What are the main differences between pellet stoves compared to wood stoves? I've thought about buying a pellet stove, but I know that wood stoves can be really nice too. What do you think I should do? The biggest difference is that wood can be gotten from along side the road and pellets must be bought. I had a wood stove for several years and loved it...my wife, not so much. Along with the wood comes bugs and bark; meaning split wood creates a trail of chips as you carry it into the house and bugs and spiders thaw out inside the house and wander free-range. There is quite a bit of effort in attaining wood; finding a source, cutting it up, bringing it home, splitting and stacking it and carrying it into the house. Pellets must be bought; as of this year about $210 per ton. Pellets are very dusty and unless you have your pellet stove in the basement, you will want to devise some way to 'clean' them. I devised a 4 foot sieve using 1/4 inch wire mesh and a large shop vac with the vac exhaust blowing down on the pellets as they roll down the sieve and the suction under the sieve collecting the dust. This method is about 99% effective. You can only generally control the temperature of a wood stove and my living room was about 86 degrees most of the time; I have a Quadri-fire insert with an external thermostat and have a more confortable and steady livingroom temperature. I burned about 600 gallons of oil per heating season; at $4.00/ gallon that's about $2400 per year. I burned about 4-6 cords of wood per year (that is a lot of collecting and splitting and stacking. I burn between 3-1/2 and 4 ton of pellets ($210 per ton), that's about $650-800 per year with a lot less work. I resisted the change to pellets; but now I have a lot of free time. I bought three pellet fires costing $7000 and paid extra to have them all inserted and extra $400 for a concrete flag to put under one of them because it was standing on a floating wood floor. one of them was inserted into my main fireplace and was really good at first ,but as the pellets came down they started to get blocked at the immediate outlet instead of falling into the metal cradle, with this, they started to burn and I feared they would travel up the shoot to where the pellets were stored. The same fire was cleaned and vacuumed before use each time and once when I used it the inside wall panels which come out for cleaning behind fell off centre and this caused fire sparks to come out into the air and onto my carpet, I had to stop it working right away and opened all the windows, but I don't use this one anymore because I feel I need to be there to make sure it is safe. The other one is a free standing one which has the smoke funnel go out into the wall outside, this burns OK but the room is too big for this one and only makes the room warm, but also if we have a power cut outage and it stops working the smoke from the fire comes out all over the room and does not go outside, it went all over my lounge and furniture. The third one is better but this year I decided to use it after not using it much in the past and the augur or the part that moves the pellets did not seem to work even after a few minutes so I decided to swish the pellets around at the top to feel if they were dropping and then the thing just stopped and blew all the electricity out. As I first said I was happy at first but I think the newer ones may work better than the three I got in 2009 which I only used for one winter, they are noisy to run and are better cleaned with the vacuum cleaner I almost ruined my cream carpet when some of the ashes fall out. With the main one in the main living area I have tried to undo the screen flat panels on the wall --left and right- because apparently you need to take those two which are screwed into the fire wall, because this is where ash builds up which you can't see, the screws are too tight and won't budge so now I would have to pay one of their guys to come and do it. They are in Hobart and I am three hours away from them, so can you imagine the cost. Am I happy with them.....!one last thing, don't buy the pellets by the ton, because if they become damp they will turn into sawdust and of no use for the fire , but hey! the they are amazing in the cat litter. 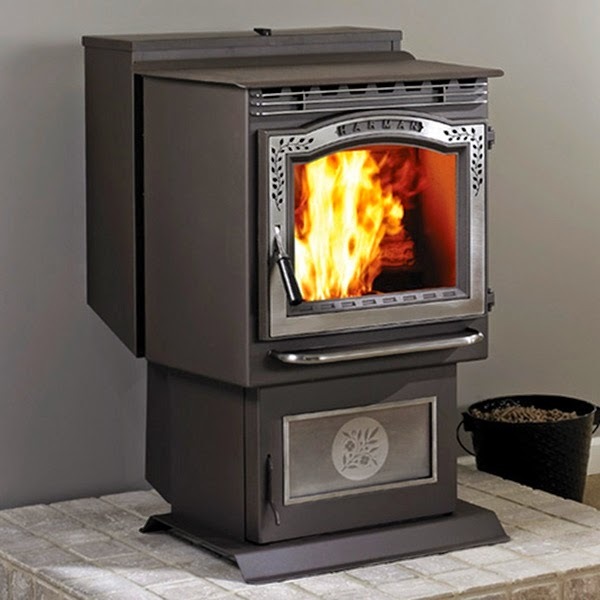 If you live in an area with frequent power outages, a wood stove makes more sense. Where I live, outages are infrequent, almost non-existent but we were without power for five days and I could cook on the woodstove which was great. We now have a pellet stove I and love it. We do have a generator for the infrequent times with are without power. And the best way to get the power back on during an outage is go to the barn, get the generator, lug it up to the house, get it primed and started and ready to plug the pellet stove in. Power ALWAYS comes back on as the stove plugs nears the generator outlet. Hmmmmm, I don't know if there is a scientific explanation for that, but it has happened a couple of times. I couldn't agree more with your comments regarding the short shrift given to pellet and wood stoves as a credible alternative to heating with fossil fuels. Your observations on the "hassle" of loading a stove (even once a day) are spot on -- and point to an unfortunate understanding we have in America about how biomass should be used. We tend to want to see wood heat replace the central heating furnace so we may have effortlessly climate-controlled indoor environments every minute of the day. Instead, we should be reevaluating our actual heating needs and what we are willing to do to reduce our consumption. Thinking of woodburners as space heaters rather than central heating units would be a good place to start. Burning fires in cycles rather than stoking is another. The physical attributes of any dry fuel (it cannot flow smoothly like a liquid or a gas) will always require human or mechanical intervention for loading. The combustion process is therefore also more difficult to manage, and requires monitoring and adjustment. Nonetheless, wood (and woody biomass) can be used in a very responsible and environmentally-friendly way. When sourced and burned locally, the reduction in environmental impact from processing/refining and transport alone put it ahead of everything but natural gas -- which has its own associated impacts. Add to that the great strides made in efficiency and emissions reduction by modern catalytic and gasification stoves and burning wood really starts to make sense. Finally, it may help people's understanding of pellets to know that a ton of pellets has roughly the same BTU content as a ton of (equally dry) firewood. The species doesn't matter -- but half a cord white oak or hickory might weigh a ton, while it'd take a whole cord of aspen or pine to tip the 2000 lb scale. Think BTU by weight, not by cord, to make a meaningful conversion from firewood to pellets. I would respectfully disagree with the equating of a ton of fire wood's BTU's with a ton of wood pellets heating capacity, if for no other reason than the ability of pellet makers to dry their product to below 10% moisture content versus the drying of firewood using the ambient moisture level in the atmosphere. I live in Washington State where the relative humidity is nearly always above 80% making it hard to dry firewood much lower than a moisture content below the mid twenties. However as in my case, I burn firewood because the cost is lower, and I still am able to go out and cut it. In a city or as the timber companies increase the restrictions on their lands and firewood cutting, getting wood heat from pellets vs. buying firewood on a level playing field puts pellets as a superior level and more a cost effective method of utilizing wood heat. Not to trash on firewood, but if paying for wood heat from pellets or firewood the choice is in the finished product, and wood pellets are less messy and contain less water than conventional firewood. Hearth and Home Technologies (HHT), purchased the Harmon company in 2007, they really bought the Harmon name. Do not buy from this company. They do not want to talk with their customers. They instruct everyone to contact their retailer where they made the purchase. I would never again buy or use a HHT Product. I think Pellet stove nowadays become outdated day by day. It is really true that making house warm by pellet stove is very cheap but people do not want to work more and more for it. Pellet stove always needs feeding and feeding which is difficult for everyone. That is why, every body like electric heater for there house. I heat my house with wood because I can't afford to replace my oil furnace. It's been six years now and I don't miss it. My house has a crawl space and when we ran out of oil the pipes would freeze. The thing I have come to realize is burning wood is a life style choice (or lack there of). If you're worried about dust and spiders you may want to stick with a oil or gas. I have no intention of going back. That being said, I'm looking into putting a pellet stove in my furnace room as a monitor. It would also make it easier to go away in the winter time. If I ad a large hoper on top maybe I could get a week out of it. Perhaps the hoper could be loaded outside which would solve the dust problem. Thanks for the info.